Mike grew up in Vermont and is a graduate of St. Michael’s College. He spent a few years in Los Angeles before returning home to Vermont to start Cosmic Bakery & Café in downtown St. Albans. Mike has served as Chair of the Downtown Board, represented St. Albans in the Vermont House of Representatives and was elected to the St. Albans City Council in 2017. After helping with SunCommon’s launch in Franklin County, Mike joined the crew in 2013. 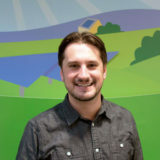 Since 2014 he has been working on SunCommon’s community and commercial solar teams, finding ways to get our larger solar projects sited and financed for businesses, factories, apartment buildings, schools and farms all over Vermont. Mike plays guitar and sings whenever he can. He lives in St. Albans with his wife Stephanie and their daughter Molly.